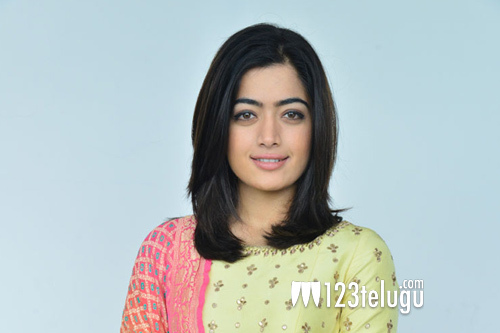 Within no time, Rashmika has become a known face in Telugu cinema. She is on top of her game with the success of Geetha Govindam. On this occasion, we caught up with her for a detailed interview. Here is the transcript. I always watch my films along with the audience and the same happened with this film as well. The way the audience was reacting gave me a good high. I knew right from the beginning that this film would click as it had full of comedy. The first thing which Parasuram told me was that I was not the first choice for the film. I never thought who rejected the film and whom I had replaced. I only looked at my role which was very important in the script and started thinking about how I would approach it. My aim was to only please the team and get their appreciation. My role was very serious throughout the film. I had to get the expressions right which was a key for my role to click. Vijay did a superb job in his role and I would crack up every time he used to say, Madam. The chemistry between us had to be right for the film to click and luckily both I and Vijay got along well and our work is being appreciated a lot by the audience. Kirik Party took me to greater heights and that is the reason which got me Chalo. As that film clicked there was no looking back in Tollywood and I have two good projects Devadas and Dear Comrade in hand. All this is happening because of the craze I have in Kannada. Very soon, one of my Kannada films will release this year end and I will do more projects there as well. In Devadas, I play a character-driven role which helps the film along with the other star cast. But in Dear Comrade, I play a simple girl without any makeup. That film will showcase what I am as an actress and will bring out the acting talent in me. I am a kind of actress who takes a lot of feedback from the audience. Many said that my make up was not good in the film. Many do not know that I am allergic to makeup. I knew that the makeup was not good but went with the team’s decision which suits my role. I love hearing to feedbacks because one always gets better from suggestions.